NEXT week it's winter as Peter Cundall notes in his latest Weekly Times column. He notes that in the southern states it's a good time to plant broccoli and garlic. So as along as it's not raining, I'll be out there in my gumboots and hand-knitted cable pure wool fluro orange jumper ($3 at the local op shop courtesy of someone whose grandma or aunty's fabulous knitting skills), turning over the compost and sowing some spring crops. 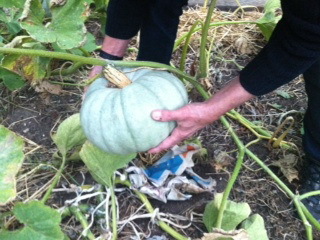 I'll also be harvesting some pumpkin to make soup and pumpkin risotto - yum. Not to mention chasing the moulting chooks about and encouraging them to eat any caterpillar or aphids still handing about. This pumpkin is now even bigger and about to turned into soup!